Emanuel Swedenborg's father, Jesper Swedberg (left), was thirty-five and chaplain to the court of King Karl XI when Emanuel was born. He died when Swedenborg was forty-seven. His mother, Sara Behm Swedberg (right), gave birth to nine children, making Swedenborg the second son. Emanuel's older sister, Anna (right), married Erik Benzelius (left), who became the professor of theology at Uppsala University. Emanuel lived with Erik and Anna for six years, until his graduation from Uppsala, and formed such a close relationship with Benzelius that he loved and received him "as a father." Emanuel Swedenborg was born in Stockholm on 29 January 1688, the third of nine children. He was the second son, but his older brother, Albert, died when Emanuel was eight. Two of the sisters-Anna, who was two years older; and Hedvig, who was two years younge-remained especially close to Emanuel. In spring of 1703, Jesper Swedberg moved into this house in Brunsbo, where he lived for thirty-three years as bishop of Skara. Swedenborg often visited his father here, sometimes for extended periods. Kristina Maria Steuch (middle), whom the family tried to arrange, Emerentia Polhem (right), whom Emanuel preferred for her beauty and brilliance, but desired to marry another man, Elisabet Stierncrona (left), who married his friend Count Gyllenborg, remained as a close friend. After her death in 1769, Swedenborg mentioned to a friend in the British parliament, C. A. Tulk, that he expected her to be his mate in heaven after his death. When Emanuel was four year old, King Karl XI appointed his father Jesper to the faculty of the University of Uppsala as professor of theology. Olof Rudbeck, professor of medicine and botany at Uppsala, was a friend of the family who had a great influence on Swedenborg's life. King Karl XII commissioned Polhem to build a drydock at Karlskrona, conceived as one of the greatest in Europe, and Polhem brought his assistant, Swedenborg, with him. 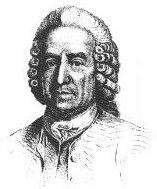 At Polhem's request, Karl appointed Swedenborg as special assessor on Sweden's Board of Mines. On 23 May 1719, Queen Ulrika Eleonora ennobled the families of Sweden's bishops. Emanuel's name changed from Swedberg to Swedenborg. Swedenborg moved in the highest circles of Swedish society. Among his friends were Count Anders Johan von Hopken (right). Count Carl Gustaf Tessin (middle), the president of the House of Nobles, whom held long private conversation about the writing. Carolus Linnaeus (left), the Father of Botany, was married in the guesthouse of Swedenborg's ancestral home, Sveden, to the daughter of Johan Moraeus (Swedenborg's cousin who had tutored him as a youth). In 1745, when he was fifty-seven, Swedenborg moved from his apartment into a home he had purchased in Hornsgatan, where he lived and wrote for the rest of his life, whenever he was in Sweden. In the garden behind his house, he planted an herb garden and built a summerhouse where he could work in more pleasant surroundings than the crowded rooms adapted to Swedish winters. Inside the garden house is the chamber organ on which Swedenborg enjoyed playing the music of Jahann Sebastian Bach. In 1908, The Royal Swedish Academy of Sciences arranged to have the casket brought home to Sweden from London's Swedish church. The Swedish warship Fylgia sailed from England with Swedenborg's casket. On 18 May 1908 the body was laid to rest in Uppsala Cathedral, in a side chapel next to the tomb of Carolus Linnaeus. The last authenticated portrait of Swedenborg depicts him at age eighty-three or eighty-four, shortly before his death. It may have been later retouched, when Swedenborg's blue eyes were mistakenly rendered as brown. The Academy of the New Church (left) was built as a private home between 1929 and 1939 by Raymond Pitcairn. The Romanesque, castlelike structure includes the notable Glencairn Museum (middle). The striking "Glass Chapel" in Rancho Palos Verdes at Portuguese Bend, California, is the Wayfarers Chapel (right), designed by Lloyd Wright and dedicated to Emanuel Swedenborg. Swedenborg's drawings show, from left to right, the solar crust surrounding the sun before breakup; the breakup of the crust with some parts moving inward and others outward; the gathering of planetary material after the crust collapses into zone; and the final emergence of individual planetary bodies. Outside view of a finite particle (left). This drawing by Swedenborg shows how particle is created by the rapid spiral motions of a more elementary particle. This hoisting machine was invented by Swedenborg for use at mines. It is power-driven by a water wheel. Swedenborg's wide-ranging inventiveness was directed also to the problem of flight. This sketch of "a machine to fly in the air" was found in the papers of Swedenborg's brother-in-law Erik Benzelius. Copyright © BaysideChurch.org, All Rights Reserved.